Israeli soldiers abducted, Thursday, four young Palestinian men in various parts of the occupied West Bank, the Palestinian Prisoners’ Society (PPS) has reported. The Jenin office of the PPS, in the northern part of the West Bank, said the soldiers abducted Amjad Jamal Milhem, 22, after stopping him at a military roadblock, near Jenin. 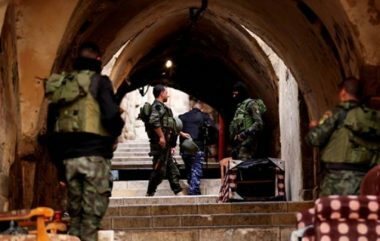 The soldiers also abducted Ala’ Shahrour and Amir Shahrour, both from the northern West Bank governorate of Tulkarem, after stopping them in occupied East Jerusalem. On Thursday at dawn, the soldiers abducted a former political prisoner, identified as Anas Ibrahim Shadeed, 30. from his home in Doura town, south of Hebron, in the southern part of the occupied West Bank. The Hebron office of the PPS said Shadeed is a former political prisoner, who was recently released, and was among the detainees who, on May 27th this year, reached an agreement with the Israeli Prison Authority, ending a hunger strike which lasted for 40 days. On Wednesday at night, the soldiers invaded Abu Dis town, east of occupied East Jerusalem, and clashed with local youths, wounding three with rubber-coated steel bullets, and causing twenty-six others to suffer the severe effects of teargas inhalation. The soldiers also abducted one Palestinian near Jenin.